Back of 1 Mark polychrome German note. 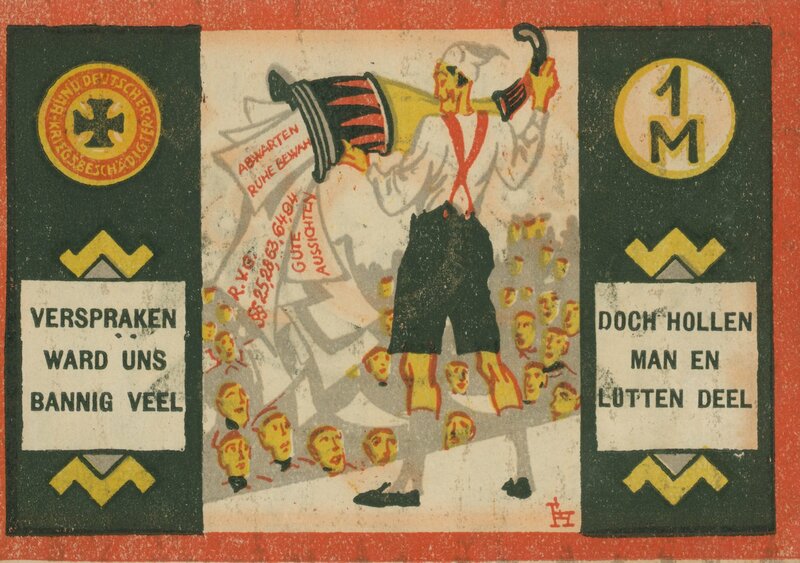 Print image of a man pouring papers with text onto a crowd; on the pages is written: "Abwarten, Ruhe Bewaren," R.V.G. § 25,28,63,64,94," and "Gute Aussichten;" to the left of the image is written: "Verspraken ward uns bannig veel" and to the right of the image is written: "Doch hollen man en lütten deel;" the two boxes of text are written in Plattdeutsch. Germany. Bund Deutscher Kriegsbeschädigter e.V.